ByronU A Degree in Attitude...Activity...SUCCESS: How do we interact in 2011? To reach consumers it is necessary to understand how people interact today. More than likely, people meet online with 1 in 5 marriages originating from an online introduction. With the likelihood of personal interaction initiating online, a strong, widespread, dynamic, and planned online presence is a must for a real estate professional to grow a successful and productive business. An online prospecting campaign must include a substantial amount of Facebook. Successful campaigns that create a measureable return on time and dollar investment usually include use of both the personal profile and a business page along with facebook ads. 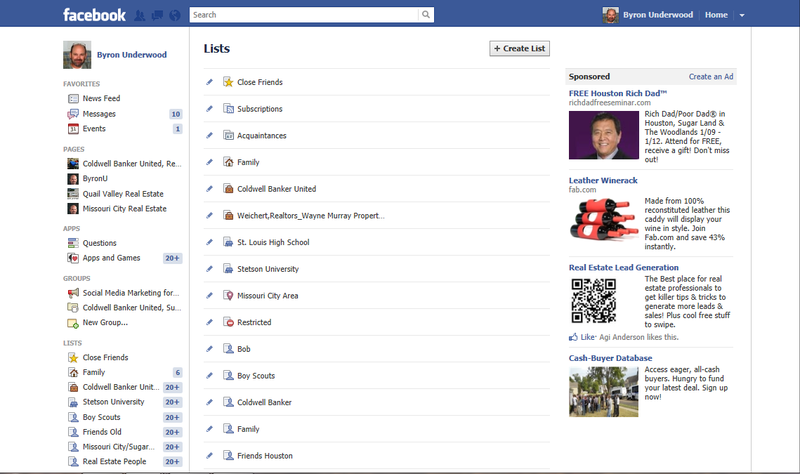 Recently Facebook incorporated Facebook generated lists to help organize friends into manageable groups. Lists allow individuals to post status updates to specific groups of people allowing a great opportunity to target market. It would be beneficial to post an open house for friends in a specific geographic area. But it may be considered spam to others who live far away from the open house. Lists also allow facebookers to review or watch posts from specific groups of people. Many people today have more Facebook friends than they can interact with. Lists allow people to streamline friends into smaller lists. The smaller groups let posts move slower down the wall so it is easier to pay attention and interact with friends.